Use vertically as shown or as a horizontal discovery center. Place low to the floor for crawlies or higher for 2's thru 6's. 32"L x 11"W. Hardware not included. Additional shipping charges apply. 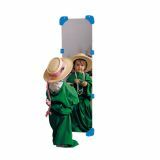 Little monsters and fairy zebra princesses will love to see themselves dressed up in this full-length mirror! 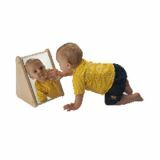 The hardwood birch frame features double-sided safety mirrors so multiple children can play at once. Stand the mirror up for dress up time or lay it horizontally for tummy time. 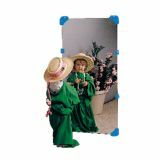 Mirror easily changes from horizontal to vertical orientation with removable feet. 48"L x 14 1⁄2"W x 16"D.
Babies will be entertained while developing motor skills. 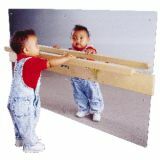 The wall mounted acrylic mirror will excite babies as they learn to pull up and eventually balance on the maple rail. Features KYDZSafe® edges, KYDZTuff® finish and lifetime warranty. 47"W x 4 1⁄2"D x 28"H. Weight 16 lbs. 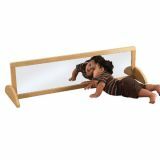 A great way for little crawlers to get a first view of themselves. Safe, clear acrylic mirror. 9"W x 8"D x 11 1⁄2"H.
Mirror with Mirror Corners and Side Safes, 12" x 48"
Attach mirrors with our injection molded polyethylene mirror corners and side safes. 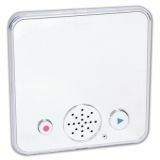 Simplifies installation and hold mirrors fast against surface. Hardware not included. 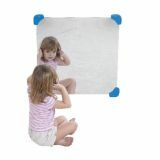 Mirror with Mirror Corners and Side Safes, 24" x 48"
Special shatter resistant PET Mirror reinforces motor visual perception, enhancing self-image. A wonderful work and play space for first walkers and toddlers! 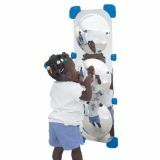 The safe, acrylic mirror surface gives little ones a peek at themselves while at play, as well as aids in the development of hand-eye coordination. 41"W x 17 1/2"H x 18"D. Weight 39 lbs. Additional shipping charges apply.